Welcome to Day 2 of the Ten Days of Reading Aloud. Have you made the commitment to read aloud to your children? If so, I hope you decide to link up this Thursday and next Thursday with what you are reading aloud! I've challenged some friends in our homeschool co-op to read aloud to their children and I'm challenging my readers, too! The most frequent questions I hear about read alouds is where to find them, or what inspires what we read aloud? There are three big ways I choose read alouds: Correlation with History Studies, Word of Mouth, and Read Aloud "Handbooks"
Let's go through each of these. 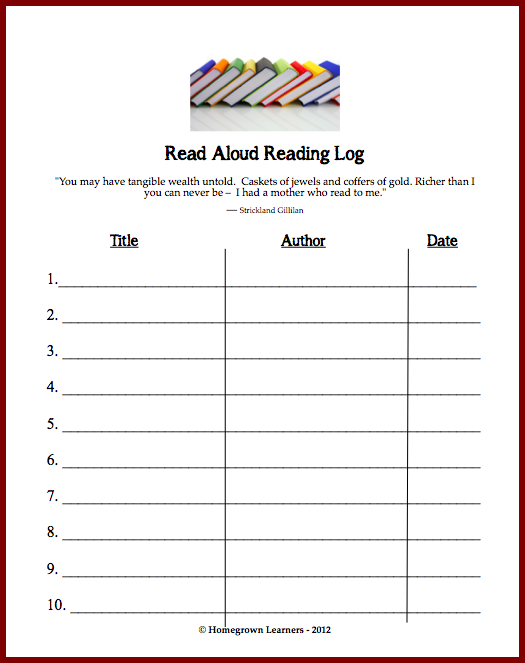 Then, I will provide you with a free printable log for keeping track of what you read aloud to your children and you will be able to enter a giveaway, too! We use The Story of The World. In the activity guide there are recommendations for read alouds. I also find myself researching the time period we are in and inevitably read aloud suggestions appear. If you are a Classical homeschooler you might be interested in the correlation of Sonlight read alouds with the cycles in the Well Trained Mind. LOTS of great information here. Ambleside Online provides excellent booklists as well. You have to do a little research to figure out what year AO your studies coincide with, but we use many AO recommendations so it's easy once you get started. Heritage History - We have been using these eReader ready living history books this year and they are wonderful! (you can get a discount by using the code MARYHOME at checkout) Best of all, they coincide with time periods in history. At the end of this post you can enter to win either a Library or a Curriculum. I will be able to choose FOUR WINNERS! I'm sure there are many other resources to correlate your read alouds with your history studies. These are just the ones we use in our homeschool. I listen and talk with other homeschoolers a lot. I like to get to know librarians and teachers. You can find read aloud suggestions in your every day life. Librarians - Get to know your librarians!! Many times they have a huge wealth of knowledge and can instantly suggest books for you. Our local librarian knows me by name and always greets me with, "So, what are we learning about this week?" Homeschool Moms - When I sit at co-op and eat lunch with my friends I learn so much! (My sweet friend Hope blogs and gives me many suggestions!) I also like to solicit advice from our local homeschool group via our email list. Blogs - Oh my goodness... I could get lost forever on blogs. My favorite read aloud blog is Hope is the Word. Just look at her chapter book read alouds page and you will get many ideas. Good Reads also has an extensive list of read alouds, as well as Simply Charlotte Mason. I'd like to think that we've read aloud A LOT in our homeschool. Maybe you can find some suggestions and ideas in some of my read aloud posts! I think my favorite might be when we read a book in a day. It's good to have at least one of these books in your personal library. You will NEVER be at a loss for what to read aloud. There you have it. 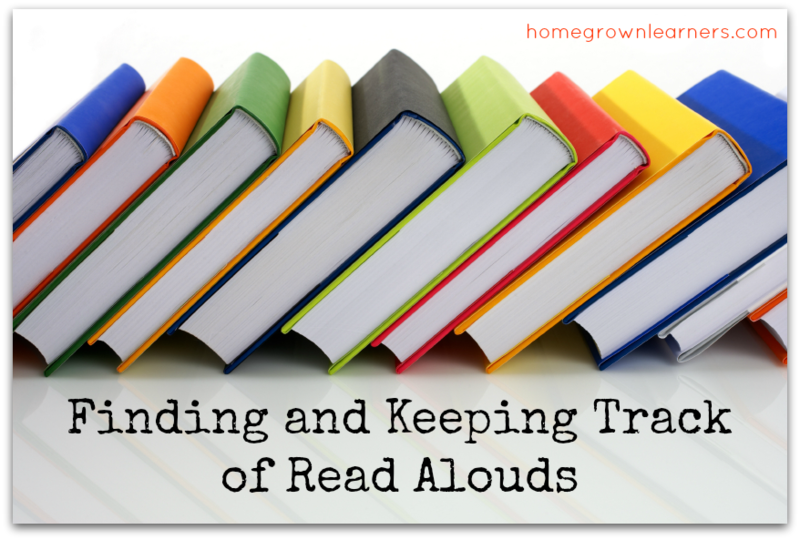 I hope this post has answered the question about how we choose read-alouds. Now, for keeping track. I've created a simple printable for you. There is room for you to log ten books on this one sheet, so print a bunch and put them in your homeschool binder. Better yet - post it on your refrigerator or bulletin board so your children can see the progress! As promised, I am giving away either a Library or a Curriculum from Heritage History. I can choose FOUR WINNERS. Please use the widget below to enter... no need to specify which you would like now; when you win you can choose!